This next image was done almost purely as an exercise for me in perfecting my skills in the use of layer masks. When I saw the original image it immediately hit me that it would be interesting if my daughter were a positive image and the rest of the image where negative. A surrealist image. I leave the interpretation up to you. I got the negative aspect by using the inverse function in Elements. 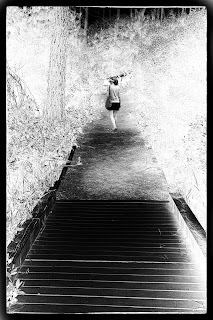 Someone said it looked like an infrared image, and I can see that. The reason I see it as a negative image is because it makes the blacks white and the whites black. To make this composite image I had to use a layer mask. Using layer masks is not difficult but doing it such that the composite doesn't look like a composite, well, that is the trick and what I need to perfect. The image is posted below. When I put this image out on Facebook I asked for comments. I was looking for anything actually. 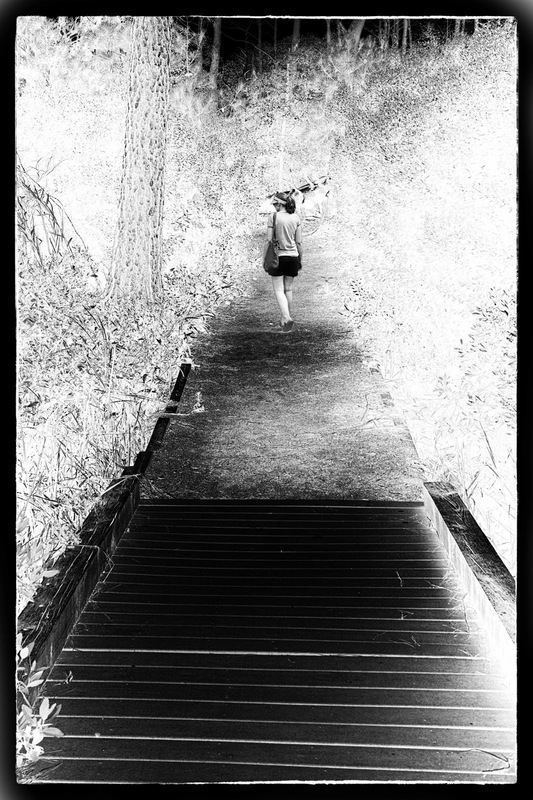 I received a number of comments from it looking infrared to the unfortunate placement of the tree, the stairs (actually a boardwalk), the girl not standing out, the dark patches, etc. All good comments. One thing I have taken away from this, however, is the fact that one has to be careful that image should not necessarily be about technique. You can't forget composition and story line. They do need to compliment each other. I failed in this much like the movie Avatar failed. Great in technique, lousy in story line.